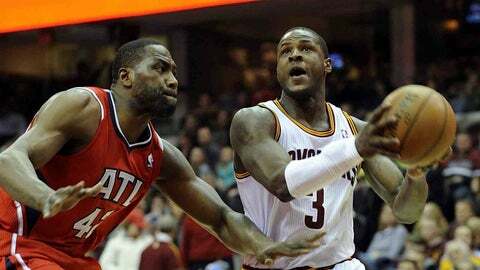 Cleveland, OH, USA; Cleveland Cavaliers shooting guard Dion Waiters (3) drives on Atlanta Hawks power forward Elton Brand (42) during the first quarter at Quicken Loans Arena. CLEVELAND — In a season expected to consist of more success and lots of pride, the Cavaliers are having a heck of time getting going. Every time it seems like cool things might be on the way, the Cavs start a bit of a fade. Or perhaps too big of a fade. Take Thursday’s game at The Q. On a couple of occasions, it seemed like the Cavs had it won. They played smart, they defended very well for stretches, and Kyrie Irving caught fire. Then, everything just sort of stopped. It could’ve been a fantastic game. Instead, it became a fantastic game that doesn’t feel so good. Final score: Hawks 127, Cavs 125 in double overtime. "We had some good moments; it’s disappointing," said Cavs coach Mike Brown. "We had plenty of opportunities to close the game at the end of regulation, at end of the first overtime and even at the end of the second overtime." Nothing was settled until a step-back jumper by Hawks point guard Jeff Teague bounced around the rim and somehow dropped through as time expired. The shot seemed to take an entire overtime all by itself. Adding to the Cavs’ frustration was the fact they actually led by five points with 2:50 to go in the second OT. Then, again, everything just sort of stopped. The ball movement, the good decisions, the defensive stands. Those things ended and so did the Cavs’ evening. There’s probably more good, and certainly more bad. But more concerning than this game is the big picture. The Cavs are 10-18. They can’t win on the road (2-12). They’ve lost two straight at home and three in a row overall. There was a time, and not long ago, that they seemed to be making some real headway in the stress-free Eastern Conference. Now, the only thing keeping them out of last place in the Central Division is the sad-sack Milwaukee Bucks. And beating out the rebuilding Bucks ain’t exactly reason for a pep rally and bonfire. Something has to change here, kids. Brown says he’ll keep searching. That’s all he can do. General manager Chris Grant will likely keep searching for some sort of trade. That’s all he can do, too. Until their leaders find some answers, the players will have to do their part. They did more of their part Thursday, and in a game that got the entire basketball world buzzing. But eventually, the Cavs need to win some of these. It’s too early to say the season is slipping away — but not too early to envision it doing exactly that in the near future.